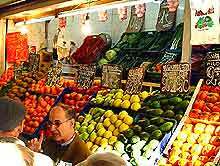 Markets in Seville provide the ideal place to purchase some of the freshest food and produce in the city, which is usually very reasonably priced. The markets offer a wonderful opportunity to try local specialities, including a wide range of sausages, cheeses and cured ham at the markets. 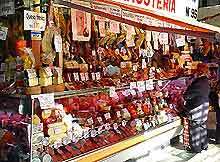 Most markets in and around Seville tend to sell a little of everything, although the city does have a few specialist markets. 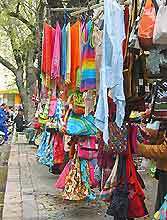 Bustling markets provide a fun way to shop, for both experienced and novice bargain hunters alike. The Mercadillo de la Alfalfa is an atmospheric street market, selling a huge range of animals. These include tropical birds, cats, dogs and much more besides. There are also cages, pet food and accessories for sale at this market in the heart of historic Seville. Seville's Mercadillo de los Jueves is an open-air market that dates back many years. Stalls include paintings, photographs, postcards, used books, general bric-a-brac and many collectibles. The market can be found in the centre of the city, in the Calle Feria area. This large, open-air market is full of a wide-range interesting objects, including Spanish dolls, flowers, fruit and vegetables, clothing and even some antiques. The Mercadillo de la Alameda is a popular market in Seville every Sunday morning and is situated in the historic city centre. This craft market is full of stalls selling jewellery, fashion accessories, sunglasses, perfumes and a wide variety of other items. At Christmas, the market expands and is a great place to find gift ideas. There are also many interesting shops near to the market. The Mercadillo del Duque la Magdalena is located in the Arenal area. The open-air market is a bustling place on Sunday mornings, where collectors gather to search for bargains. With antique coins, stamps, postcards and many other collectable items on sale, this exciting market is held in the historic centre of Seville. This weekend art market is staged beneath the Triana Bridge, on the banks of the Guadalquivir River. Visitors will find all kinds of local handicrafts, ranging from paintings and drawings, to ceramics and homemade soap, as well as traditional flamenco dancing, live Spanish music and further street entertainment. The stalls can be reached via the Betis Street stairs or the Callejon de la Inquisición.